Singapore has become less attractive for real estate investment, going by a report released yesterday. It fell four rungs to seventh place in a ranking of property investment prospects next year for Asia-Pacific cities. The drop was due partly to fears of oversupply in some segments, according to the Emerging Trends In Real Estate: Asia Pacific 2014 report. "The appeal of Singapore has weakened over the past year, which explains the retreat from its normal ranking in the survey's top three," the report wrote. Still, it added, those surveyed had mixed views of Singapore's prospects and "investor opinions remain quite polarised". Around 250 real estate professionals were interviewed for the survey. Some investors thought the market was oversupplied and had excess liquidity from Singapore's growing real estate investment trust (Reit) sector, the report noted. Others said the growth outlook remained strong. The report was jointly published by the Urban Land Institute (ULI), which is based in the United States, and consultancy PricewaterhouseCoopers (PwC). PwC Singapore partner Choo Eng Beng said investing in Singapore real estate was getting more expensive because of "the expected higher interest rates, compressed property capitalisation rates and tighter regulations". However, he added, some investors still "see room for better returns with low vacancy rates and potential for higher rentals". The report noted that the professional services sector had generated increasing demand for small-office space. 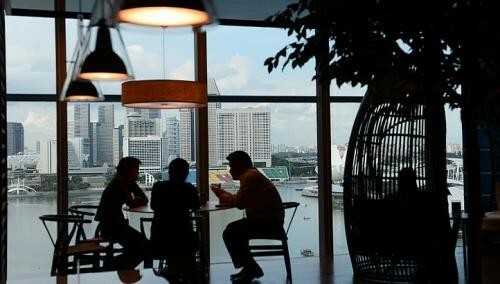 Sales of strata office space in Singapore's Central Business District were strong in the first six months of this year, but have dropped off because of property market cooling measures, it said. Topping the list of cities in the Asia-Pacific region set to attract real estate investment next year was Tokyo. Next came Shanghai and then Jakarta. Mr Toby Dodd, the country head at consultancy Cushman & Wakefield Singapore, said he expects office market fundamentals to "remain positive" and that limited new supply could lead to "some rental increase". He believes the vacancy rate for Grade A office space in the Central Business District will shrink from 6.2 per cent now to about 5.5 per cent by next year. Average rents for Grade A space are expected to rise from $9.60 per sq ft (psf) per month currently to $10.06 psf per month by next year, he added.